This week in Missouri, a voter-approved constitutional amendment goes into effect to help cities access more money for drainage projects. Reporter Adam Allington saw the ballot measure for the amendment in the voting booth on Election Day, and like many of us facing wordy ballot measures, he had questions: What is this funding for? Why do we need it? And what does it even mean? In an effort to get to the bottom - literally - of one of some of those questions, Allington did a little urban spelunking into the miles of storm water drains running underneath the city of Columbia, Mo. He met up with a guide to help him find his way. I met "Johnny Tarr" down in a drainage ditch just off Interstate 70. Of course, Tarr's not his real name. But what we're about to do isn't exactly legal. "We're facing toward the Columbia Mall and its various parking lots, and we'll head into the storm drain that services all these parking lots," says Tarr, gesturing to a four-foot drain pipe sticking out of the embankment. Tarr has the kind of reckless curiosity your mom warned you about when you were a kid: always sneaking into places he shouldn't. Instead of taking the street, he likes to ride his bike underground through a maze of storm drains and tunnels. "From where I sit, I think of this as a public work, similar to a sidewalk," says Tarr, "and it should be our right to access it if we feel like it, because we're paying for it." 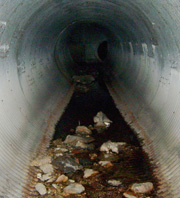 We crawl through the first pipe and eventually spill into a larger tunnel made of concrete. It's pitch dark, wet and strangely warm. Before I got into the drains I was excited about the idea of a little covert civic trespassing, but now that I'm actually here, it's terrifying. My tiny headlamp barely shines three feet in front of me. When my eyes adjust, one of the first things I notice is a plastic hospital bracelet floating in a pool at my feet. I try not to imagine how it got there. Noticing the fear in my eyes in response to some of the strange echoes that reverberate out of the darkness, Tarr takes a moment to explain. "Sometimes we'll hear a noise," he says, just as a metallic 'thump' rings out. "It always creeps people out, but it's cars driving over manhole covers over your head." Eventually I'm able to push aside my fear of sewer-dwelling serial killers and look around. The tunnel itself is maybe five feet high, and not quite as "Indiana Jones" as I'd expected - more hallway than mine shaft. "This is all here just because we live in a world that water can't penetrate and so it has to be flushed away," says Tarr. When you take away the earth's ability to drain itself, the water has to go somewhere. And every city with rooftops and pavement, even in the desert, runs the risk of flooding during storms. "To avoid a flood, they have to put the flood, literally underground," explains Tarr. Eventually that flood ends up where we're standing. Tarr walks over to a patch of ceiling where the concrete has crumbled and fallen to the floor. Rusting shafts of rebar hang dangerously at eye level. What we're seeing in the tunnels is a spot where the tunnel is completely full during floods, causing the ceiling to erode over our heads. "The rebar is exposed and rusting and ultimately falling to the ground," explains Tarr, "and so we'll see bits of this on the floor as we go along." Stormwater systems at their most basic are a transportation utility - a massive network of drains and pipes to move water away from buildings as quickly as possible. The problem is that all across the country, drains just like this one are falling apart. And since all this engineering is underground, the cost to repair and upgrade is massive, approaching a trillion dollars just for the next 20 years. In fact, to try to cut down on that enormous cost, many civil engineers in large urban areas are busy designing systems that keep raindrops out of pipes altogether. After about two hours underground, we're still under the parking lot, but I figure we must have traveled well over a mile. Under a gutterbox, we see an opening above us where the sidewalk meets the street. "That's where things pour down," notes Tarr, "a lot of pollutants get dumped down here intentionally or unintentionally via runoff." The Environmental Protection Agency ranks urban stormwater as the second leading source of water pollution in the country, and it's easy to see why. As Tarr and I continue deeper into the tunnel, small pipes in the walls around us spew out a kind of slippery greasy silt, which we try to avoid stepping in. It's most likely a mixture of anti-freeze, heavy metals, oil and salt from the parking lots above us. When we finally emerge into the light near a quiet stream on the other side of the mall, Tarr points out where the sludge water we've been walking through flows freely into the creek. "When the shock value of being underground and in a creepy place wears off, you realize all the sick stuff you're looking at," says Tarr. "We're all stakeholders in this public works project. This is everybody's water and it's going to everybody's tap." I went into the drain tunnels because I wanted to understand why stormwater was so important that my state put language about it into our state constitution. The answer I got back was that managing stormwater is crucial to the well-being of our cities, and it's not just about keeping our streets high and dry. Keeping our streets dry means sending toxic runoff into the Missouri River, which continues on to St. Louis -- the city where I live. To me, the idea of that oozy pipe sludge washing up in my back yard is much scarier than any creepy noises in the drain tunnels underground. Great story except for the very obligatory warning. Underground infrastructure while often publicly owned is off-limits to the public for a very good reason, it's potentially very dangerous to access - even deadly. Urban confined spaces should not be entered without air pumping equipment, a explosive and noxious gas detector and/or a harness. (wait, did I mention flash floods?!) Public works professionals are trained for entry. Next time get storm sewer system insight from the professionals. before the 'sludge' hits the beautiful little stream?? It doesn't have to be a FACTORY. Some filteration is better that none. I think the city it serves, should pay for it.